Super-bacteria, or bacteria resistant to traditional antibiotics, is scary enough – and the increased use of antibacterial agents only makes them stronger. The only way they could be more threatening is if they were airborne, capable of spreading far and fast. 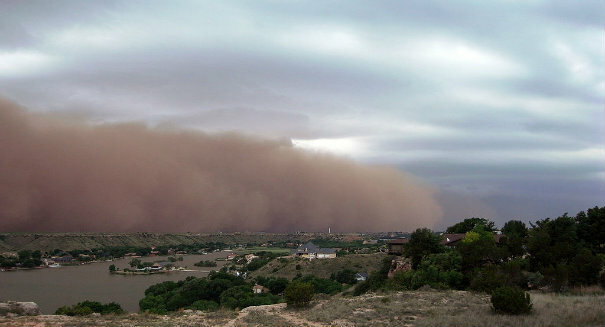 Unfortunately, that’s exactly what researchers from Texas Tech University found in examining dust that originates in the cattle farms of the Texas panhandle. While science has long known that harmful bacteria can be spread by touching or consuming infected substances, this is the first study to prove that bacterial DNA can be effectively aerosolized. That it’s drug-resistant super-bacteria only makes the finding more disconcerting. “This is the first test to open our eyes to the fact that we could be breathing these things,” said co-author Phil Smith, an environmental toxicologist at Texas Tech. That these super-bacteria are popping up in cattle feedlots isn’t surprising. It’s estimated that 80% of the antibiotics in America are used on livestock. Much is used to treat disease brought on by industrial feedlot conditions, but it’s also used as a growth agent. If bacteria were looking for a training ground to become resistant to antibiotics, a cattle farm would be the ideal place. That those bacteria can now become airborne goes a long way in explaining why humans suddenly find themselves exposed to it despite all precautions. Mayer and Smith conducted the study by collecting dust samples from 10 cattle farms across the Texas panhandle and southern plains. They blasted the dust onto mesh screens, and then took the samples to their laboratory for analysis, where they discovered just how concentrated the bacteria were.